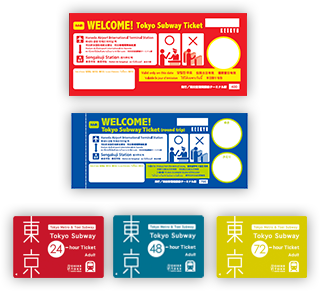 Tokyo Metro can offer various discount tickets that suit your style. 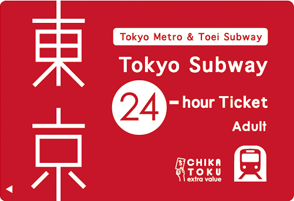 Information regarding the Tokyo Metro 24-hour Ticket and other one day tickets for unlimited rides on railway lines in Tokyo. 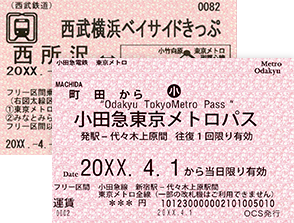 Information regarding combination tickets which allow unlimited rides on all Tokyo Metro lines and a round trip on another railway line. 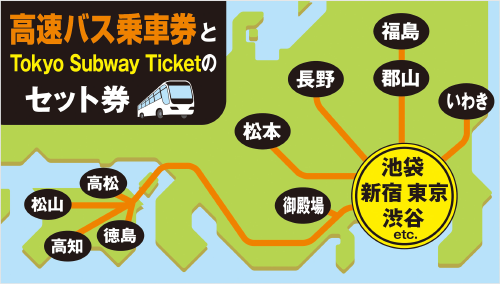 Information regarding set-priced tickets for transportation between the airport and downtown Tokyo, and Tokyo Metro One-day Open Tickets, etc. Information regarding tickets for domestic visitors residing outside Tokyo, Kanagawa, Saitama, Chiba, Ibaraki, Tochigi, Gunma and Yamanashi prefectures as well as overseas visitors. 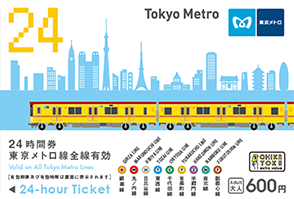 Information regarding one-day tickets from public transport companies in Tokyo, which includes the Tokyo Metro Special Combination 1-Day Open Ticket. Show Your Ticket to Get Value! Advantages such as discounts at various spots of interests in Tokyo!